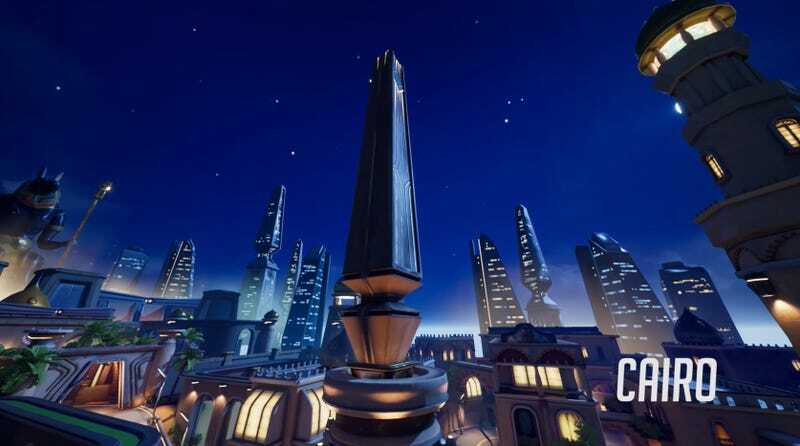 Overwatch already has one map set in Egypt, but fan Joshua llorente has made a very good case for the addition of another. llorente spent two months creating his own Cairo map from scratch in Epic’s Unreal Engine. “All assets including textures and models are created by me,” he said on Reddit. “No downloaded content.” It’s a sight to behold, so behold it. On its surface, the map looks like it has all the makings of a chill evening stroll, but look closer and you’ll see a labyrinth of alleys and side paths—paradise for a good Tracer or anyone else who likes to dart in, make war, and then peace out. The map’s been getting lots of praise on sites like Reddit and YouTube. “Why. Are. You. Not. At. Blizzard,” asked YouTube commenter Johnny Terraform. Cairo is the culmination of llorente’s Overwatch-themed map work so far, which also includes an impressive Favela map. Right now, llorente is wrapping up his college thesis, and while he’d be happy to work at Blizzard, he’s keeping things realistic.